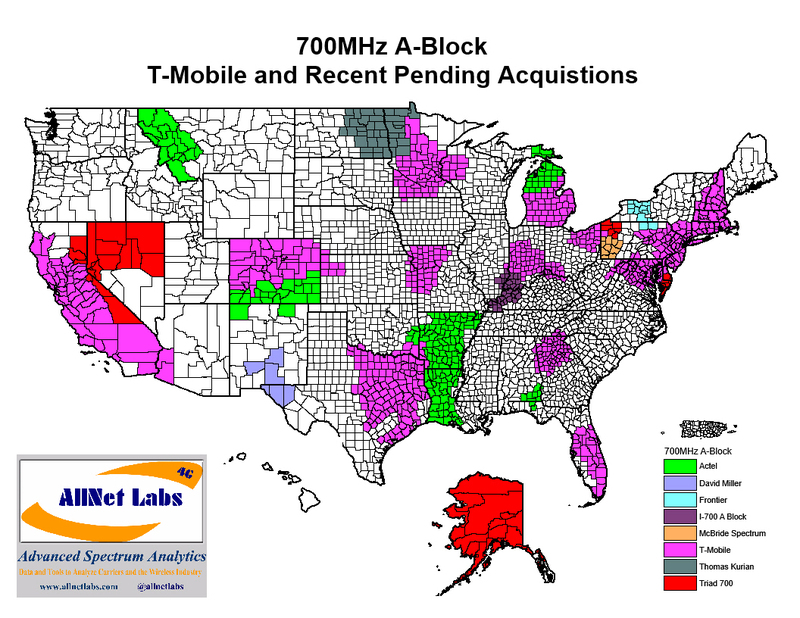 T-Mobile US' (NYSE:TMUS) hunt to score more 700 MHz A Block spectrum continues, with the carrier disclosing that it wants to acquire licenses in that band in four areas across the country, including areas around Reno, Nev., and Anchorage, Alaska. Click here for a larger version of this image from AllNet Labs, which shows T-Mobile's recent and pending 700 MHz spectrum purchases across the country. According to a recent FCC filing, T-Mobile wants to acquire the licenses from Triad 700 LLC, a holder of four 700 MHz licenses. In addition to the licenses in Reno and Anchorage, T-Mobile wants to acquire licenses in Erie, Pa., and Salisbury, Md., which sits near the border of Delaware and is close to the Chesapeake Bay. According to Brian Goemmer, an analyst with wireless-spectrum research firm AllNet Labs, the Triad deal covers a total of 2.43 million POPs. Triad Communications is the umbrella name for the portfolio of companies that includes Triad 700. "Triad's management team has extensive experience in all aspects of wireless operations dating back to 1985," according to an FCC filing. The Triad management team includes Barry Lewis, Craig Viehweg and John Mason. According to the company's website, in the late 1980s Lewis was involved in building and operating some of the nation's first urban cellular networks, in Atlanta, San Diego and San Francisco. In the 1990s, Triad began focusing on the rural cellular market. The firm has participated in auctions for the cellular, PCS, WCS, AWS and 700 MHz bands. Triad also says members of its management team have served as advisers, directors and early investors for several carriers, including MetroPCS, Leap Wireless affiliate LCW Wireless, Cleveland Unlimited (the now-defunct Revol Wireless), Coral Wireless (MobiPCS-Hawaii) and PR Wireless (OpenMobile-Puerto Rico). In the past two months, according to T-Mobile CEO John Legere and CTO Neville Ray, T-Mobile has made spectrum deals with smaller A Block spectrum license holders that cover a little under 18 million POPs. AllNet's spectrum database shows that the transactions that have come to light to date add up to around 15.88 million POPs. In addition to the Triad transaction, those deals include T-Mobile's purchase of spectrum from the likes of CenturyLink subsidiary Actel (6.4 million POPs), McBride Spectrum Partners LLC (2.91 million), Frontier Communications (1.51 million), I-700 A Block LLC (1.1 million), David Miller (903,000) and Thomas Kurian (623,000). The purchases build on the A Block spectrum T-Mobile bought from Verizon Wireless (NYSE: VZ) for $2.4 billion covering 150 million POPs, in a deal announced in January. T-Mobile is hoping to use the spectrum to enhance its LTE-coverage footprint and provide strong in-building penetration. The overall value of 700 MHz A Block spectrum scored a boost last year when AT&T Mobility agreed to support the band with future devices. AT&T has started selling a few devices that support A Block spectrum,or Band Class 12, including the Samsung Galaxy Note 4. Correction, Sept. 29, 2014: This article incorrectly stated the number of covered POPs involved in T-Mobile's 700 MHz A Block purchase from Verizon. It was for 150 million covered POPs, not 158 million. This article also failed to note that AT&T has started selling a few devices that support A Block spectrum,or Band Class 12, including the Samsung Galaxy Note 4.